We are writing to inform you that, as of November 4, 2012, Rose City Copwatch has disbanded. This is not a decision that we made lightly, and it does not come as the result in any internal conflict or controversy. But over the past two years it has become increasingly clear to us that our model of organizing is ill-suited to our present context. Beginning with the period of unrest following Officer Ron Frashour’s murder of Aaron Campbell in 2010, and continuing through the Occupy protests and beyond, we have consistently found ourselves struggling to keep pace with events as they unfolded. Meanwhile, a larger and larger share of the attention of our membership and volunteers has been taken up with other projects that were better able to respond to the urgent needs of the present moment. Our efforts to reinvent the organization foundered, largely because we lacked a core group that could devote its full energy to the project. Rather than preserve the organization simply for the sake of preserving the organization, we have decided that the more responsible thing to do is to close it down and turn our attention elsewhere. There’s no lack of work to be done. . . .
–and the struggle continues. As a parting gesture, we intend to distribute our remaining resources among other organizations that continue to move us toward the goal of a world without police. Among those groups receiving what is left of our funds are Critical Resistance, Incite: Women of Color Against Violence, the Committee Against Political Repression, and the Rose Hips Medic Collective. We want to stress that we do not view the end of our organization as a defeat. Rose City Copwatch came into existence under a very specific set of circumstances; that those circumstances have changed is, we believe, partly the result of our work. For almost a decade, we pushed the limits of what was possible in opposition to the police, staking out a position that was, at once, seeking to limit police violence immediately and also focused on the ultimate goal of abolition. 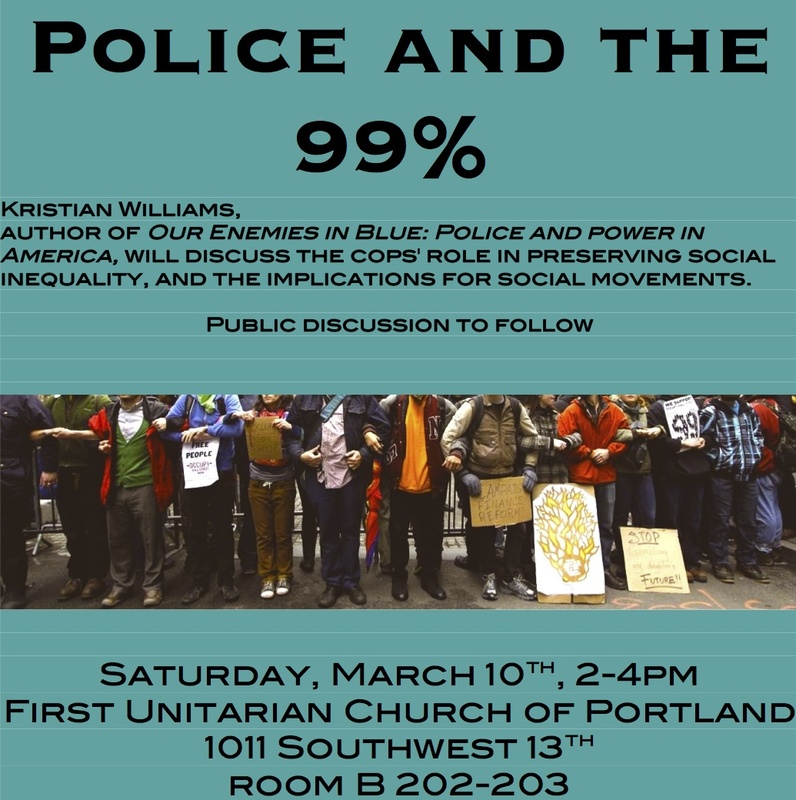 During the period of our activity, though not by any means solely by our efforts, police abolition became an established point on the political spectrum, the idea of community-based alternatives to policing has spread across the left (and beyond), and the practice of copwatching has become commonplace even among people who don’t know that there’s a word for it. No one organization can take credit for those shifts, but we like to think we’ve done our part. Of course, we’ve also made our share of mistakes. As the context changed, it brought to the surface many of the flaws in our organizing, the limits of our structure, and the weaknesses of our strategy. We’ve all learned much from the experience, and, as a final project, we will be releasing a critical self-assessment sometime next year. It is our hope that an honest accounting will aid the movement even after the organization is gone. We would like to see others learn, both from our successes and from our mistakes. Finally, thank you for the support you have offered over the past several years. Rose City Copwatch was always a small group, but we knew that others were with us, doing their part to help the work along. Now, as our little group dissolves back into the much larger movement that produced it, we hope that you will take the opportunity to redouble your efforts and continue fighting for a just, free, and equal society. Don’t waste any time with mourning. Organize! On Saturday, July 28th, Portland Police Officer Justin Clary fired multiple rounds into the car driven by Billy Wayne Simms as he attempted to drive away. The vehicle plowed into an occupied apartment building, after which police placed a guarded perimeter around the scene. Simms was left wounded in his car without medical attention and his family was denied access to him or to any information about him during this time. Hours later, Simms was pronounced dead at the wheel of the car. Since then, the Police and local media have attempted to justify this murder by expounding a litany of violent offenses the victim was alleged to have been involved in in the days prior. Regardless of any past criminal history and whether police accusations against the victim are true or not, there is no justification for Billy Wayne Simms’ murder. The actions of this officer and of the Portland Police Bureau in supporting him are a brutal, tragic reminder of the realities of police violence in working class communities. Billy Wayne’s family has been hit with an unimaginable, sudden tragedy. On top of loosing their son, the family must come up with $1500 to retrieve Billy’s body from the morgue in the next few days. They are asking for the community’s support to help them raise this money. We need YOUR help raising this $1500 so that Billy’s family can have a proper funeral for him. Though the looming political questions raised by yet an other police murder will have to be addressed in the coming weeks, immediate support to Billy’s family is needed. If you want to be updated on future actions after these funds have been raised, email us and let us know. 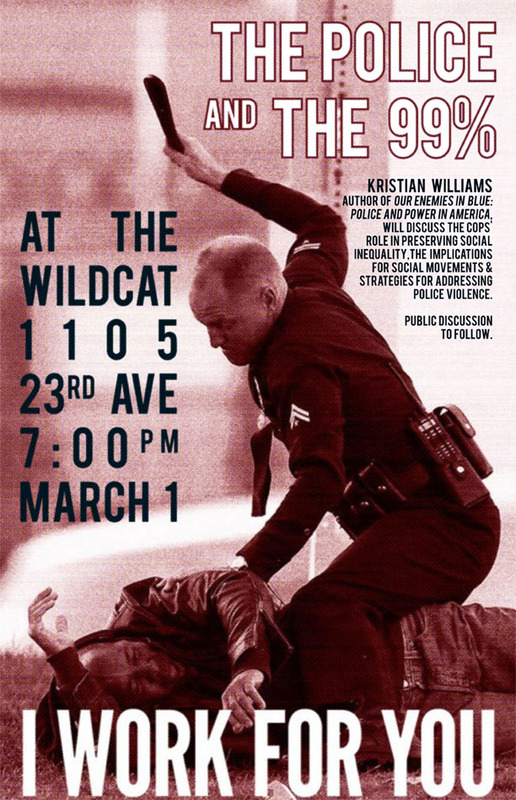 Author Kristian Williams will be speaking about police and the 99% in Seattle on Thursday, March 1st, and in Portland on Saturday, March 10th. Fire killer cops and keep them fired! Hey, we added a paypal button so you may donate to us through the internet if you feel so inclined! Thanks for your support!